Via Mark Thoma, we are sent to this post by Kash, Street light. Something interesting is happening with this recovery. Actually, it’s something that was also an interesting feature of the Great Recession of 2007-09: the manufacturing sector of the US economy has been performing surprisingly well. In fact, it wouldn’t be too much of a stretch to say that manufacturing has been one of the important drivers behind the economic recovery (such as we’ve had) over the past two years. Normally manufacturing output and job growth lag overall economic recoveries in the US. This time manufacturing is leading it. 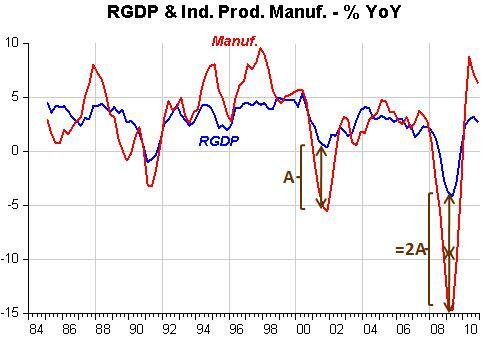 And this is how he describes the picture below: “The following chart shows the change in real GDP and manufacturing production through the last three recessions (1990-91, 2001-02, and 2007-09). In each case manufacturing contracted much more sharply than the economy as a whole. And in the recessions of 1990 and 2001, manufacturing was slower to recover than the economy as a whole, and didn’t really enjoy a period of rapid expansion until well into the recovery in each instance. But this time is different; manufacturing output has actually been growing faster than overall GDP, right out of the gate”. That´s just an “optical trick”. 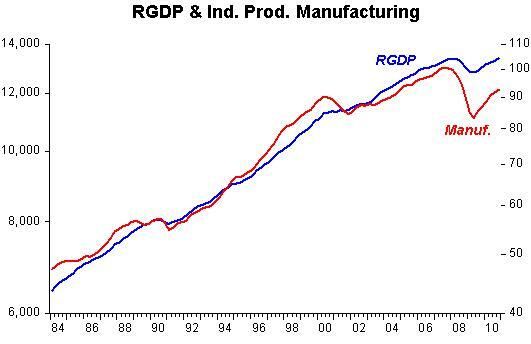 Manufacturing production is growing faster because it dropped much more than RGDP (in this recession the relative drop in manufacturing production was about twice the size of the fall in the 2001 recession). Just like the basketball player that “bends his knees more” will “jump higher”, so growth (a proportional change) will be higher, even for the same absolute change, if the starting level is lower. The following graph puts things in perspective by plotting the log levels of the two aggregates. In the previous recessions manufacturing production growth (measured by the slope of the line) was higher than RGDP growth before the event. In the 2001 recession – the technology recession – investment fell significantly, so that manufacturing of capital goods fell more than overall output and there was a longer “adjustment period”, after which growth came back at rates similar to the growth rates for RGDP. Kash goes on to show that “in the previous two recessions, manufacturing lost more jobs (proportionately), and recovered jobs more slowly (if at all), than the private sector as a whole”. Unfortunately the picture he shows is of the absolute changes over 12 months. The figure below depicts the percentage (or proportional) change. 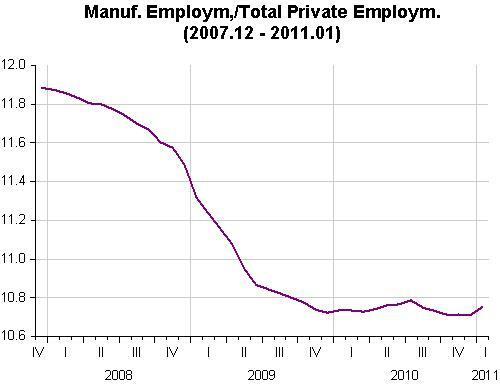 The next picture illustrates the long term trend of manufacturing employment relative to total private employment. Would you think “strong progress” (even if there were any) in manufacturing employment could “save the day”? From the same graph including only the circled portion (starting Dec 2007) the image one gets is of those water shoots that fall fast and flatten out just before the kids are jettisoned into the pool. 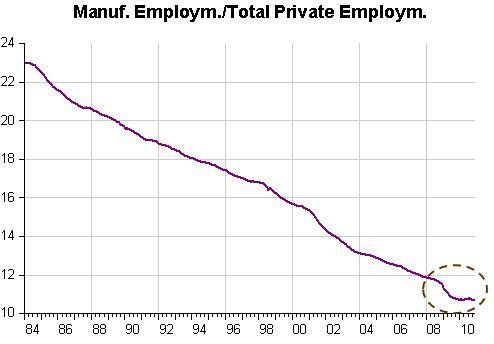 In the last 27 years manufacturing employment relative to total private employment fell by 50%. After shooting down during the recession, it´s taking a “breather”, growing at a rate similar to overall private employment, or by just enough to keep the ratio relatively stable. Manufacturing – production or employment – is certainly not leading any “band” that you might think of. Mark Thoma was right in showing some skepticism. Ending on an up note: Despite all that, as Scott Sumner notes, the US can still be described as “The world´s manufacturing juggernaut”! However, I still think Kash has a modest point. 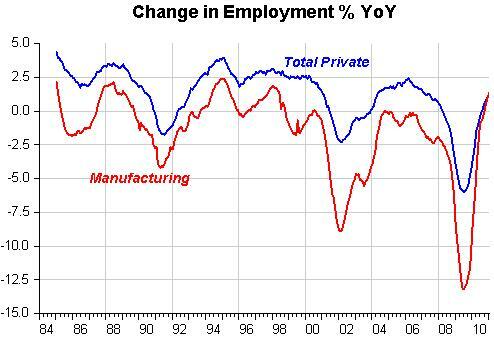 Manufacturing employment is on a downward secular trend. (Like agriculture, probably all our needs may be someday met by only 2% of the population.) Disentangling the performance of such a cyclical sector from its historical trend downward is difficult but it does seem to be doing better this recovery than the last two. And this time the housing sector is certainly not going to be leading a recovery. Perhaps it would be better to say, rather than manufacturing leading a recovery in employment, in contrast to previous recoveries it is not making things any worse. In a way , true. After all, the ratio flattened!